Last weekend--So here's the story. We are at the reception and my hubby took K to the restroom the first go round, I was taking her on her second. Well, I had no idea where the restrooms were, AND I'd had a few glasses of wine, so I let K lead me there. I walked in and though, "huh, unisex" when I saw the urinals in the corner. The overwhelming stench of urine should have been another clue. Whatever. I walked over to the "curtained" toilet and K did her thing. We washed up and walked out and there was my hubby standing outside. He had a look of bewilderment on his face, "why did you go in there!?" 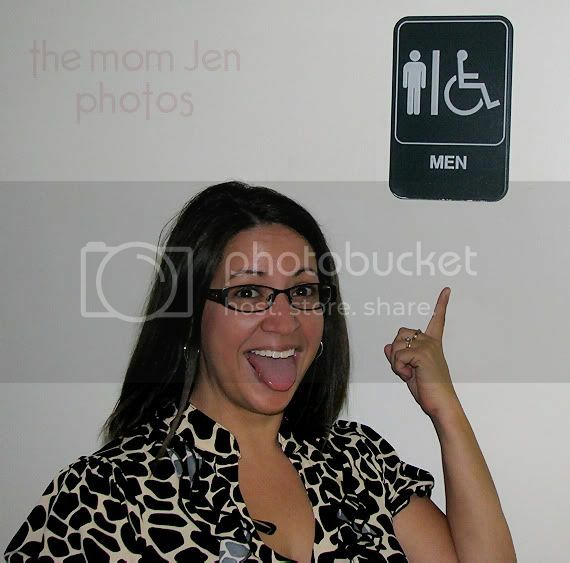 Well this is where K led me...."she led you to the men's restroom! that's where I took her earlier!" OMG, I was so embarassed afterwards and apparently I can't read when drinking. Oh my gosh, that is too funny! She is a very good listener, though! Haha. Too funny! Merry Christmas to you and your family. Hahah that is hilarious! Don't worry, I am pretty sure that has happened to me before! how funny...new slogan...dont drink and get dragged by kiddos. I love that!!! So glad no one else was in there! I am pretty sure that has happened to me before! First...I love the dress...didn't comment before. Second, that's pretty dang hilarious. You didn't tell me you had a 15-year-old sister! And why was she drinking?! So gorgeous. Been there, done that, by myself, not drinking, so embarrassing.